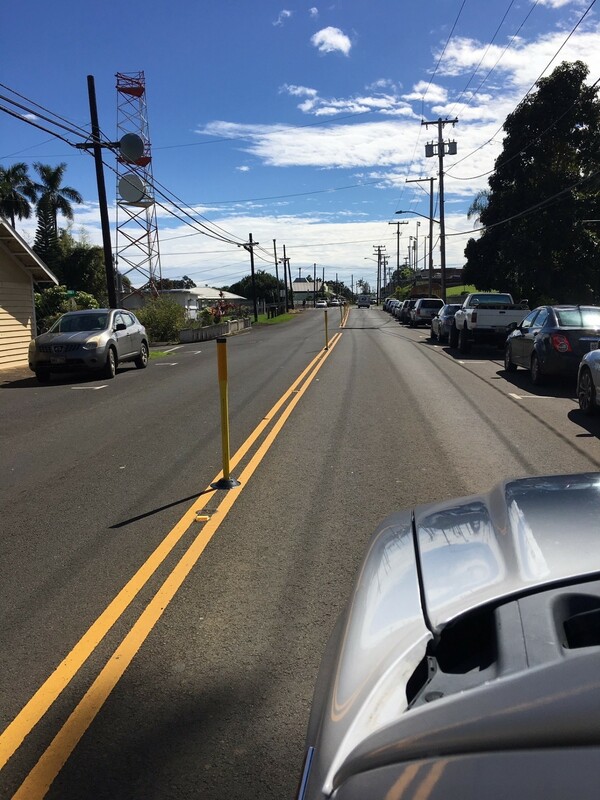 HONOKAA – In late January, the Hawaii Department of Transportation (HDOT) began a project to enhance pedestrian safety on Mamane Street/Honokaa-Waipio Road (Route 240). 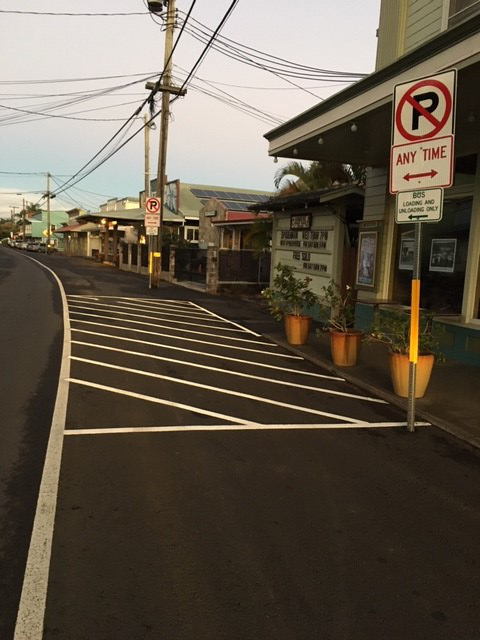 The project, which added gateway in-street signs, traffic calming measures, and a bus loading/unloading zone on the road through Honokaa Town was completed in late February 2019. 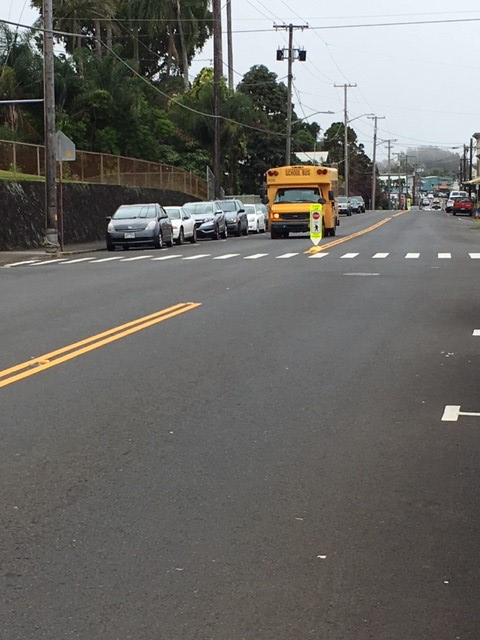 Late last year, HDOT began installing pedestrian gateway in-street treatments statewide to draw driver’s attention to crosswalks not paired with a signalized intersection and to serve as a visual reminder of Hawaii’s law requiring drivers to stop for pedestrians. Similar treatments placed on roads in Michigan were shown to increase yield rates to pedestrians from 10-percent to 90-percent. The Michigan DOT study on gateway in-street treatments can be found here. The proximity of Mamane Street/Honokaa-Waipio Road to a high-speed facility raised concerns in the community over the speed of traffic through the town. HDOT met with community members and Senator Lorraine Inouye last year to discuss these and other concerns. The treatments installed are designed to remind drivers to reduce speed to an appropriate level on Route 240. The posted speed limit in the residential/town area is 25 mph. Other concerns addressed through this project were the observed practice of uncontrolled pedestrian crossings and vehicles making illegal U-turns. HDOT will continue to evaluate the installed treatments to ensure they are having the desired effect of increasing safety in this vibrant, mixed use corridor. Comments or suggestions on the pedestrian safety work in Honokaa can be sent to the HDOT Public Affairs Office at dotpao@hawaii.gov.